The Carrickfergus men&apos;s casual jacket from Dubarry&apos;s outdoor clothing collection is crafted from waxed cotton with real leather detailing. A warm winter jacket, thanks to the PrimaLoft fill, this key piece of country clothing also has a water repellent finish. 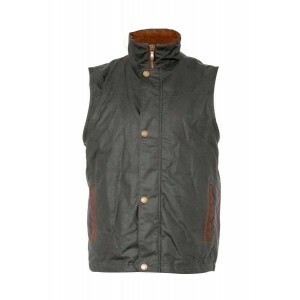 Stylish and practical outerwear for both city style and country wear. Perfect worn over Dubarry men&apos;s knitwear with Dubarry leather country boots or Chelsea boots.Men&apos;s waxed cotton jacket with real leather detailing, metal centre front zip, covered by studded placket and water repellent finish. The Carrickfergus men&apos;s casual jacket from Dubarry&apos;s outdoor clothing collection is crafted from waxed cotton with real leather detailing. A warm winter jacket, thanks to the PrimaLoftÃ fill, this key piece of country clothing also has a water repellent finish. Stylish and practical outerwear for both city style and country wear. Perfect worn over Dubarry men&apos;s knitwear with Dubarry leather country boots or Chelsea boots. Waxed Cotton with PrimaLoft® fill for extra lightweight warmth. Sponge clean outer fabric & leather only.